This week, we are proud to feature Lonnie Morrison, who is one of the original founding members of the PVMAC. 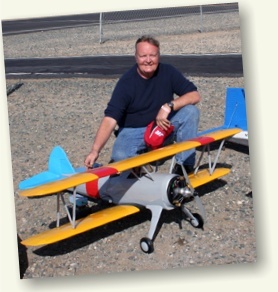 You can always find Lonnie either at the Prado field or at Hobby Club USA, where he is always willing to share some of his knowledge about flying or life in general. I am a 70-year-old retired diesel mechanic. My dad owned El Monte Tree Service and I worked with him until I was drafted into the army in 1963, when I spent one year in Vietnam. I have done many improvements to my home including building an oak mantle and staircase. I enjoy working with wood. But what brings me the most pleasure in life is my almost-4-year-old great-granddaughter, Bailey. She is the sunshine in my life. I started when I was 14 years old flying U-control planes. I have always been interested in airplanes and flying. My father-in-law helped me build my first Cub after I got out of the service. The plane was OK but the electronics in those days were not very dependable. It lasted a few weeks, then I started building another plane. Too many to count. At first it took months to build a plane from kits or plans. Now I can build one in days. I have many today in my garage and trailer. I like building as much as flying. The friendships I have made since starting with PVMAC are what I enjoy most. Another favorite thing is helping new pilots learn to fly and helping them with their planes. I enjoyed racing the Unlimited RC pylon planes for several years. I am also flying IMAC in contests. Now that I am older, my favorite thing to do is sit in my chair at the field holding a cup of coffee in one hand and watching the planes fly and visiting with my friends. My favorite planes to fly today are the giant scale IMAC planes. They are easier to see and fly and are much more stable. My best memory is helping with the Toys-for-Tots event that we have held at the field for many years. I have enjoyed this and I especially like teaching young people the basics of flying. My best memory is helping with the Toys-for-Tots event that we have held at the field for many years. I have enjoyed this and I especially like teaching young people the basics of flying. Another member and I were racing T-6 40 size planes of the same color, and when the planes came around a pylon they touched. Both planes went out of control and crashed. When I retrieved my plane I realized that it wasn't mine. We had both tried to control the wrong plane. We laughed about that for a long time. I learned that I have to keep my eyes on my own plane. I am working on a giant scale P-51 Mustang with DA 60 motor. It will have smoke, flaps, and retractable landing gear and tail wheel. I would fly in a P-51 Mustang. That has always been my dream.